Here is a compact chart comparing the different bouldering grading systems and their respective difficulties. Please keep in mind that these are relative approximations. The French bouldering system found in Fontainebleau is wide spread across Europe and is split into bloc and traverse grading designated by a fb before the number. This system can be quite confusing as long boulder problems sometimes acquire a traverse grade which is comparable to the French sport climbing grades. However, even here there can be wide variations. Anyone who has been to Bleau and tried some of the low grade problems will quickly realize that the grades fb 4-5 can be quite stiff and not at all anything like V0-V1. The V system (or V-scale) originated in the United States and is widely used on the continent. It has also found its way into the British bouldering scene with areas like the Peak and the Lakes adopting the system. For a beginner, progression on this scale can be quite daunting as the jump from V1 to V2 and V3 is quite high. 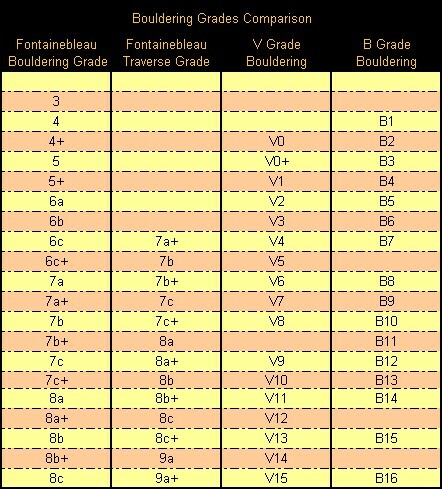 I've included the B bouldering system, which is almost out of date, since it has been used for grading in Annot, France. I find the system quite well arranged, providing a clear progression through the lower difficulties. It looses some coherance at the peak difficulties, but this probably won't bother normal climbers.